People who own a cat know that cat carriers are an essential accessory to have. There are benefits to this, and one of them is that it helps keep cats secure and safe. It also prevents them from jumping from open car windows. So, whether you have adopted a cat or you have been a cat parent for years, you have to ensure that you have the best carrier for your furry friend. But now the question is; which carrier should you buy for your cat? And how do you know it is the right one for your furry friend? To help you answer these questions, you will need to consider several important factors such as size, load capacity, durability, and other factors. Let’s discuss these factors. Like any other carriers, the size matters a lot. You have to buy the right size; not very big and bulky, especially if you are traveling on a plane. There are specific size restrictions when you are carrying your cat on the plane. Besides, a large crate will be awkward to carry around in the cities as it is difficult to balance. Additionally, you don’t want a carrier that is too small as that will be uncomfortable for your cat. This can make it anxious and stressed out. Therefore, you will need to figure out the right size for your cat carrier. To ensure you get the right size, you need to take accurate measurements of your cat’s actual size. Measure its length from its nose to its tail. Next, you will need to measure the height by taking measurements from its paws to the topmost edge of its back. Once you have these measurements, add 2-4 inches as allowance. This will give your cat enough room in the carrier. TIP- your cat’s carrier should be about 1.5 times the size of your furry friend. This will give it an ample room to move around and at the same time ease the carriage of your carrier. You also need to consider why you need to invest in a carrier and the kind of situations it will be used for. Is it for carrying your cat to your vet? Or is it for taking your cat in the boot of a car? If you are going to be holding your carrier in public, then you might need to have a carrier with a harder case for added security. Cat carriers are available in various types and durability is based majorly on the material used in its construction. Most carriers are made of fabric materials including canvas, cotton, polyester, and microfiber. Some are also made of specialty synthetic fabrics. The most important factor to look for is the stitching of the fabrics to ensure they don’t get damaged easily at the seams. Carriers that are double stitched are way better than those with single stitches. You might also consider the strength and durability of various materials. Some cat lovers prefer polypropylene while others prefer durable plastic materials. Carriers made of tempered plastics provide better strength, protection, and durability than those made of fabric. They are also easier to clean. But on the other hand, carriers made of polypropylene are easier to store and carry around. You also need to consider maximum weight capacity a carrier can accommodate. You may buy the right size, but if construction is not steady enough, then you risk damaging the bag and hurting your furry friend. For instance, if your cat weighs 15 pounds, then your carrier should have a load capacity of at least 17 pounds. It is not advisable to buy a carrier that has equal load capacity to your cat’s weight. Remember that you will also be carrying your cat’s accessories and care items in the bag. Therefore, you need to factor this as well. There are carries with plush beddings that offer more comfort for your cat. The cushioning enables your cat to feel more relaxed throughout the journey. If your carrier doesn’t come with beddings, you can still purchase them separately. However, make sure that the beddings don’t take too much space as your cat needs to have room for moving around. A cat crate with mesh panels is better than one without enough ventilation. Mesh panels allow for optimum ventilation and help prevent suffocation. This will help your cat feel calmer and more relaxed. Handles are an important consideration. They need to be sturdy and ergonomic for easier and secure handling. Once your cat is inside the carrier, it can get reasonably heavy. You don’t want to drop your carrier when the cat is inside as this can be traumatizing for both you and the cat. Unfortunately, this is a common cause of injury, and it is avoidable if you go for a carrier that has a decent handle. Cats don’t like getting into a carrier. In fact, getting them inside their carrier is the least enjoyable part of owning a cat. You might suffer bruises as the claws come out. Some of the best cat carriers on the market feature multiple access points that may give your cat different entry points into the carrier. This can make your life easier if you have a cat that hates traveling. If you are taking your cat for long journeys, then you should go for a carrier that has water and food points inside. Traveling is always a stressful experience for any cat, and they are going to need to eat and hydrate. Therefore, consider going for a carrier that is compatible with food and water containers. You can also find a product that has them already included. Your kitty will need to go to the toilet due to the sheer amount of time they will spend in the crate or due to stress. Accidents do happen once in a while even if you have trained your cat not to relieve themselves in the carrier. Therefore, it is important to have a carrier that has a surface that is easier to clean. Ensure the carrier is machine washable or has removable parts if it is a soft product. Now that you know the important things to look out for in a good cat carrier let’s discuss some of the most common kinds of carriers that are on the market. Just as the name indicates, these carriers are designed to be carried on your back while you are traveling with your kitty. They are ideal for journeys when you want to carry your kitty around. Most of them are thinner than other types of carriers but are taller. They are convenient for shorter trips and are thus not recommended for long journeys. These cat carriers are of different kinds; it is a general term given to a wide range of carriers that do not have a hard shell. They are more comfortable for your cat and are lighter. However, they offer lesser protection. If you are to go for soft carriers, you should go for one with the highest quality fabric as low-quality soft carries can be opened easily by your cat from the inside. The most important thing to look out for in these carriers is the standard of the zipper. Picking products from renowned brands is important. These are carriers designed to be used by those boarding a plane. They are designed to be placed underneath a plane seat in front of you. They have a soft construction and are designed to meet the strict restrictions and safety standards set by major airlines. Also, they normally have expandable sections to offer extra space while others are generally large but slightly collapsible. These carriers have limited use cases for kitties. They are the least comfortable and least secure. Your cat will be trying their best to get out of it. They are designed to accommodate the lower part of your cat’s body while their heads are stacked out. Be prepared to struggle and get scratched by your cat while trying to fit it inside. Although there a few situations where sling carriers are better than other carriers, it is best to avoid them. These cat carriers have soft construction, but some are hard to collapse. As the name suggests, these carriers are designed to collapse to make storage easier. They are easy and quick to expand or collapse, but lower models can be quite flimsy. Therefore, it is important to pick a quality product from a reputable brand. These carriers can either be hard or soft-shelled. As the name suggests, they are designed to be loaded from the top as opposed to the side. However, the best top loading carriers also have side access points as well. Many cat owners prefer these carriers as they offer an easier way of getting your kitty inside the carrier. These are becoming more popular recently as they offer more convenience for cat owners to move their cats with minimum effort. Most are made of soft materials, but there are some with hard materials with wheels. However, keep in mind that just because it is easier for you to move your cat in it doesn’t make it easier for your kitty. If you are not pushing it on a smooth surface like a sidewalk, then your kitty will suffer from distress because of the vibrations. Ensure that you get a product with a decent handle to enable you to lift your cat in an area with no smooth ground. For pet owners with two cats, this is a good option as it will help you transport them at the same time. Transporting them in one dual carrier will be less stressful as compared to transporting them in different carriers. Ensure that your dual cat carrier has ample space for each cat. You should get a carrier that is roughly 2X the size of both kitties combined. May not be suitable for cats larger than 45 lbs. Overall, the PetLuv Soothing “Happy Cat” carrier is ultra-soft, light and designed to offer reliable feline transportation. Better yet, it’s a game changer when it comes to anxious cats as it offers cat mobility and comfort. This design from Petmate is simple and sturdy and is ideal for small and medium-sized cats. It comes with top and front loading options which makes it easy to get your cat in and out. The cat carrier does well to blend security with comfort. As a product that is both light and sturdy, having a comfortable bed makes it stand out. Besides, both the hand and shoulder straps ensure easy portability making it an ideal travel carrier. All sides contain air mesh for great ventilation. Here’s is a durable yet great-looking option for pet owners who need to travel with their cats. The carrier is lightweight weighing around 2 pounds and is soft sided with padding inside for comfort. It is also waterproof, easy to clean, and can fold down for easy storage. Finding a cat carrier as large as this is rare. The pet carrier is also comfortable enough for your pet, featuring a fleece base and tunnel that your cat will love. The bag is fully zipped with ventilated sides on top making it safe and comfy. Overall, this product has a clever design for a traveling pet carrier. 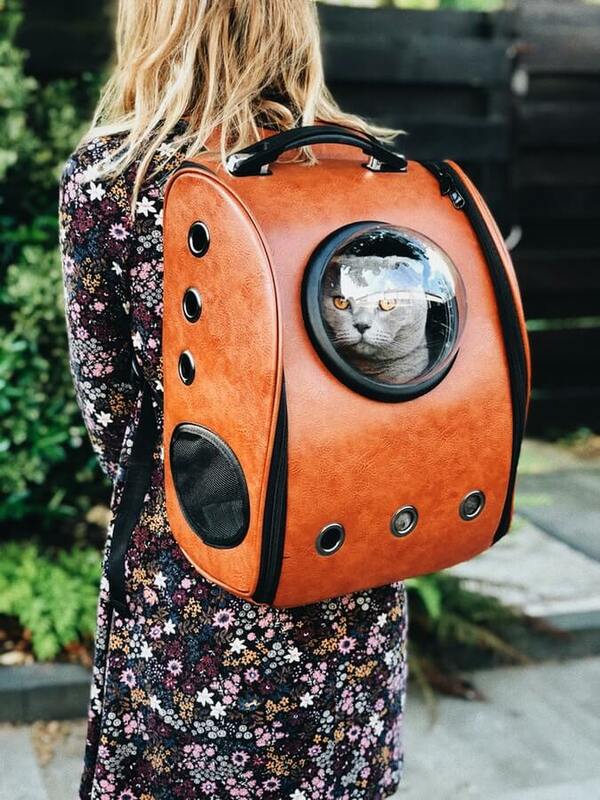 And although it has a few flaws that tend to bring it down, this carrier would be a great addition for your next trip to the vet with your beloved cat. The A4Pet Collapsible Carrier is one of the best airline-approved pet carriers available in 3 different sizes. The easy-to-assemble cat carriers come with top and side loading options to make it easy to get your pet into and out. The Pawfect Pets Soft Sided carrier many positive reviews and this shows it is a quality pet carrier that works on long journeys. It has met all rules and regulation for USA flights. The product is safe even with clever pets and is easy to clean and store. This carrier offers a comfortable design that’s safe for your cat. If you have a small or medium sized, you can get this best cat carrier with dual side access. It is safe for air travel with a safety buckle that prevents your cat from escaping. This carrier has a sturdy plastic structure with 2 smart doors that will keep your cat protected. The handle on top makes it easier for owners to carry it around. The ample space it offers is suitable for just about any cat. Traveling with your kitty can be a fulfilling experience if you have the right carrier. Therefore, it is important to invest in the best carrier for your cat. Consider size, weight capacity, comfort, durability, handles, security, and other factors we have discussed in this guide. All the above 10 best cat carriers we have reviewed will help you have a fulfilling experience traveling with your cat.